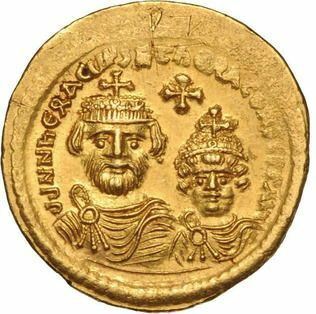 Constantine III was Byzantine emperor for 3 months in 641, making him the shortest reigning Byzantine emperor. He was the eldest son of the Byzantine Emperor Heraclius and his first wife Eudokia. Constantine became senior Emperor when his father died in 641. He reigned together with his younger half-brother Heraklonas, the son of Martina. His supporters feared action against him on the part of Martina and Heraklonas, and the treasurer Philagrius advised him to write to the army, informing them that he was dying and asking for their assistance in protecting the rights of his children. Indeed, he died of tuberculosis after only four months, leaving Heraklonas sole emperor. A rumor that Martina had him poisoned led first to the imposition of Constans II as co-emperor and then to the deposition, mutilation, and banishment of Martina and her sons.